Hobbit and I came home and talked about the situations in Thailand and in the Philippines this evening. We didn't get too overwhelmed by the result that Cambodia, not Thailand, has sovereignty over a disputed promontory around a 1000-year-old temple, but we got too emotional over the sufferings in the Philippines. Reading all the news about the Haiyan typhoon just broke our hearts especially when children were involved. We could totally imagine children crying for their parents or parents crying for their children. 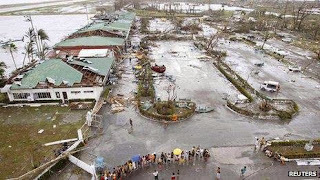 The following is an example that demonstrates how even in the midst of a huge disaster as the Haiyan typhoon, God is present in the lives and sufferings of those involved. Read the story here.